10 Most Inspirational Bon Jovi Songs To Motivate You - Motivate Amaze Be GREAT: The Motivation and Inspiration for Self-Improvement you need! Bon Jovi is a band that sticks in our minds forever even if you're not a rock fan. Some might think of them as a cheesy band with corny lyrics, but they have inspirational and motivational songs for days! From their early years has a band of glam metal in the 80s, passing through their more hard rock 90s sound, to a more pop rock version in 00s, Bon Jovi's name stayed relevant throughout all this decades and it's still is one of the top notch go to when it comes to inspirational songs. This inspiration comes from the combination of lyrics and sounds. Powerful chorus and hard drums, awesome guitar riffs or beautiful melodies. And of course the incredible vocal performance of lead singer Jon Bon Jovi. Our take: We open up with a bang! The video is the lyrics version cause the original video takes too long for the song to start. This song is the total package with lyrics and a strong melodic hard rock sound. The message it's just so powerful! This could be anyone's anthem for living! Never forget it's YOUR life and you have to make decisions or else someone will decide your life for you. When I shout it out loud"
This is the mindset and the determination needed to make a change. I just want to live while I'm alive "
Claiming your life and your right to live it under your rules! You have to push yourself to that moment where you have to make a decision, that's why the line "It's now or never / I ain't gonna live forever" it's the necessary ingredient. You don't have all the time in the world to live, live now and feel alive! I did it 'My Way'." This reference to Frank Sinatra "My Way" song is priceless. It completes the feeling of the song, it's all about making things in your way, your life, your decisions, your way of living it! "For Tommy and Gina who never backed down"
A classic reference to some inspirational folks Bon Jovi fans know about, see if they ended up in our list also! Our take: This is a great power ballad from the late 80's with a fabulous melody. It's about commitment to a love a relationship that's falling apart. These five words I swear to you"
Lots of highlights here but the one that stands out for us is "Words can't say what love can do"! Is that a great truth? Feelings cannot be expressed in words it's all about showing and proving. Actions count, words don't! Although the topic is love and a fallen relationship, I wish I could promise things in this style, really touching and inspirational. Our take: This is a good old Bon Jovi classic song and what's inspirational and creative about this is the fact that Jon Bon Jovi compares his life as a rock star touring to a cowboy from the Wild West , where "he is wanted dead or alive". I'd drive all night just to get back home"
Bon Jovi - "Born To Be My Baby"
Our take: Another classic rock song from the late 80's alluding to a love relationship from a middle class couple and their unconditional love despite all outside problems in their lives, simply beautiful and romantic. The chorus is so powerful with awesome devotion. The opening it's just brutal reality but a great standpoint. Whatever the circumstances couples go trough love and their lives must be regarded has a strength that stands up against any eventual weaknesses. And baby, I was made to be your man"
They won't make of me when I'm dead"
So, Jon Bon Jovi was suffering from hangover and wrote this masterpiece? And lay you down on a bed of roses"
Bon Jovi - "Keep The Faith"
Our take: This song has the same title as the 92 "Keep the Faith" album that marks a new style and sound from Bon Jovi, leaving the big hairs and metal roots behind. The song lyrics express a despair situation with all the negativity the world has but finding an answer in keeping the faith, an incredible touching performance by Jon Bon Jovi. Lord we got to keep the faith"
Indomitable faith that's what we all need! Our take: Another power ballad and this time from the 90s Bon Jovi. Once again Jon Bon Jovi's vocal performance is huge and deep. This song is about a breakup of course, but nevertheless if you were around in the 90s teens just loved this and it was an anthem. I was the love theme for may couples from that time and beyond. That this old dog kicked up"
This song was intend for a movie called "Romeo is Bleeding" but eventually ended up in band's album. But, baby, that's just me"
Classic lines and simple facts without pretending someone he's not. I've made mistakes, I'm just a man"
to say to you until the end of time..."
Just terrific lyrics here and all about transmitting is passion in the best way he possibly can. Our take: This is the most recent song in our list, from 2009 Bon Jovi's album. It's dedicated for a usual suspect in the band songs, the working middle class and everyone who endures in hope of a change for a better life, simply inspirational! You gotta stand up for what you believe"
This is so good that it seems like a motivational speech and we just love it! How could we not to? Stand up for your rights! You don't need to follow anyone just because... Keep on keeping on what you believe. Our take: Ok another one from the 80s, no real clip, we spare you the pain to see their hairstyles...but we would like to concentrate on the lyrics. The song is about a wife cheating on her man, the song intro it's just brutal and classic, indeed inspirational. The drums are strong as they come for this great hard rock classic. Love the contrast "I play my part and you play your game", like why the hell are you playing games with me? Let's get real because this is real life, just play your part also. Our take: You had to deal with their hairstyle after all on this one, but we couldn't leave out this classic clip and of course... we couldn't leave Tony and Gina out from our top 10 list either! This is the best known Bon Jovi song in the world probably and how beautiful it is. A couple dealing with the usual middle class struggles that makes the faith in their love their biggest asset. How this song pumps you up with so much adrenaline it's just bombastic! "She says, "We've gotta hold on to what we've got. For love we'll give it a shot."" Is Gina a motivational speaker? Well she's very good at it! So powerful, hold on to what you got! Whoa, livin' on a prayer"
The adrenaline rush of living on a prayer with your mate! 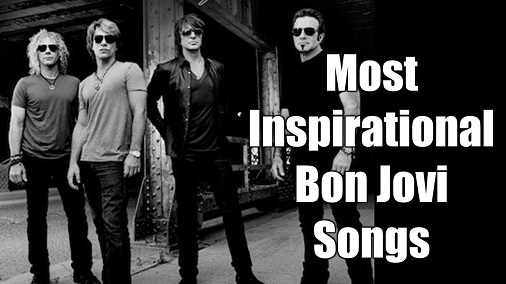 Hope you liked our selections, tell us what's your pick for the most inspirational Bon Jovi songs, is it on our list?